Ugh. 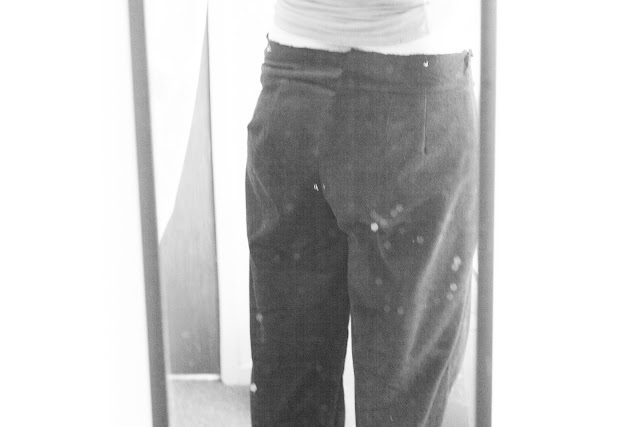 I just got most of the way through making a pair of slacks. You see, 'pants' are what lots of us wear to work. No, I don't mean undies. I mean those long things that go from approximately your waist to the top of your foot. They are often grey or black, and are a professional item of clothing, often forming the bottom half of a suit. 'Slacks' are usually worn by the elderly, or occasionally people who just don't mind having no bum. Because that's what slacks do. They give you a slack bum. They tend to have either darts or pleats from the waistband. (side note: sometimes these things are awesome for fitting pants. And sometimes they just make them old-lady shaped). Yeah, this is the back. Ordinarily, I have a big round bum. Simplicity 2860 is meant to be 'Amazing Fit', and by all accounts - it really is for most people. The idea is you cut out your size, and by your measurements you will be either slim, average, or curvy shaped. There are large seam allowances so you modify the pattern to fit as you go. Brilliant idea! However, I'm back to my usual problem whereby the measurements don't lead to the right size (for me). My measurements clearly indicated a size 20 curvy... I should have already been dubious. I've never been a size 20. But, trusting in the 'Amazing Fit', I plowed on. These are at least two sizes too big. 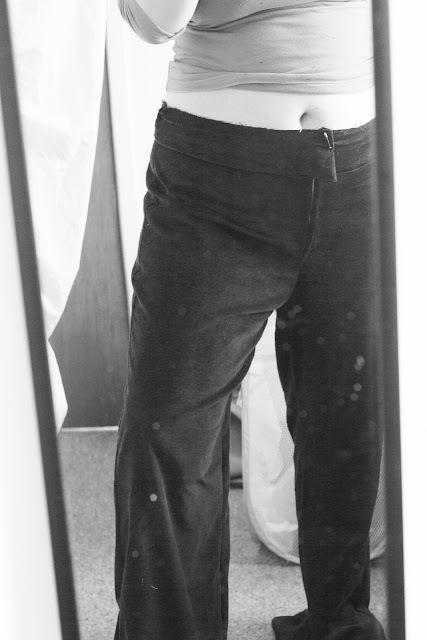 The style was horrible on me anyway, with the waistband in a weird place and much too wide legs. I thought my problems with ease in 'Big 4' patterns were to do with my usual FBA. Turns out that Big 4 bottoms also don't fit. I am never going to be able to trust the body measurements on these patterns, and it's immensely frustrating. I don't mind adjusting, but that's nearly impossible when the whole thing is completely the wrong size. I'm just so frustrated. From now on, any pants I make will probably be based on the Jalie jeans. I'll just add extra to the seam allowances for less stretchy fabric. What to do next? Never buy Simplicity, McCalls, or Butterick again?? Oddly, I have less problems with Vogue. Their patterns possibly have less ridiculous ease because they are closer to RTW designs... I don't know. I'm all for alterations. But I didn't want to redesign a pants pattern in order to get the right fit. Sigh. If I could wear skirts to work, sewing would be much simpler! On the other hand, I already know that the Jalie pattern will work for stretch fabric - good to have one reliable pattern! That's so frustrating, going to all of that effort for something that doesn't even up working as expected. On the up side, at least you know never to use that pattern again. Yes! I'm trying to look to the positive too :-) And thankfully, they didn't take too much time (though I wish I could have the fabric back). What a bummer when the pattern turns out way too big like that. I haven't had much luck with amazing fit patterns either. When I choose a pattern for pants I try to look at what the finished hip is, hopefully printed on the paper. I usually go for 2 inches of ease. If my hips are 36, then I will try to cut the pattern size that shows the finished hip to be 38 to 38.5. 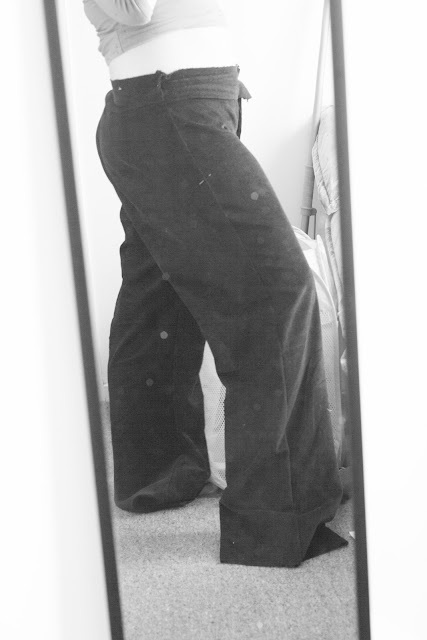 It's good you have a pants pattern that works, and I'll bet you will have better luck with Burda pants patterns too. At least that has been my experience. I applaud you for trying a new pattern though. I have been kind of stuck in wanting to make patterns that I know work for me. I need to get outside the box again. I'm kind of glad it's not just me, with the Amazing Fit patterns. Perhaps part of the problem is that the pattern has at least 4 inches of ease built in after adjustments... I appreciate your advice there! I totally agree with you. I've given up on the big 4. I reckon there is a sort of vanity sizing built into their ease. It frustrated me so much that I couldn't rely on their measurements. Now I sew only Style Arc, Burda and Kwiksew, and some Ottobre. I'd like to try Jalie too. With Style Arc, I make alterations based on my measurements vs those for the size I've ordered, sew them up and they fit. Every time. Burda has wide shoulders but I've found the sizing is pretty consistent and the mag gives a whole heap of measurements which is handy. All patterns are expensive here, we don't have 2 dollar sales, and I'd much rather put my time and fabric into making things I can wear. I've never tried Style Arc - they might be my next attempt! They're even based in Melbourne (where I'm from), so that sounds like a good plan. Patterns are hideously expensive here in NZ - I agree that it's important to have some idea that the pattern will work when it's purchased. Incidentally, Burda's broad shoulders work perfectly for me. Thanks for adding to the discussion! I don't think I'd sew again if I had this experience! It sounds horrible! Thanks for the extra recommendation - I'm off to look at their website now! I have that Simplicity pattern, recently my local useless fabric store had a sale on Simplicity patterns and I had heard good things about the Amazing Fit patterns, so I bought ALL the AF pants patterns. After reading about your experience, if I make them I will be super cautious. Thanks for the heads up. I don't know, a lot of the people on Pattern Review had success with this pattern - it might just be me. Though when I look closer at some of their photos and reviews, I could probably have foreseen some of the problems I had. It's not you, it's the pattern. First off, notice what a terrible job Simplicity did with the legs. While I have added 6" to my hips over the last 30 years I did NOT add 6" to each knee. Notice that the width of each leg goes up the same amount as the hip. The legs balloon out very quickly. All of the pants patterns I've ever purchased had the same fit problem: a fold on the back that ran from hip to knee. (See your top photo.) I of course assumed that my body was somehow faulty. My body is fine, your body is fine, everyone's body is fine. While PEOPLE keep their bums directly above their knees, the pattern companies didn't accommodate this fundamental relationship. Look at your back pants pattern. Find the midpoint of the back crotch level (distance from crotch point to the outside seam 90degrees to the straight grain line) and draw a perpendicular line down the leg. Ideally this line would run through the middle of the knee. But it doesn't. Usually it's an inch off. What the ???? Mid point of crotch level and knee line up on the front pattern but not the back pattern. Why? The pattern companies decided making the outside seams match was the priority. It allows you to alter the outside seam and match plaids easily. But it makes bums and thighs look awful on the back. I purchased a pattern making textbook and that was my "aha!" moment, when I saw that their outside seams didn't match. I have decided that pants must be redrafted for individual measurements and to align knees and thighs. I'll be looking at tissue fitting with new eyes now, thank you so much!